Be the first to share your favorite memory, photo or story of R.. This memorial page is dedicated for family, friends and future generations to celebrate the life of their loved one. 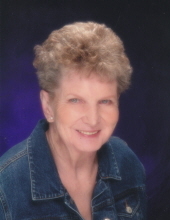 Joanne Maitrejean, age 85, born in Tacoma, WA went home to be with her Lord and Savior Jesus Christ on Sept. 10, 2018. She was an active member of the Holy Disciples Church, TOTs Club and a longtime volunteer of the Food Bank. She enjoyed Bunco nights, playing games with friends, traveling, ceramics and spending time with family. She was known for being kind, generous and loving. She was cherished and will be greatly missed by all those who knew her. She is survived by her brother Ernie; son Garry; daughters Judy and Kari; 12 grandchildren and 21 great-grandchildren. Preceded in death by her husband Vern Maitrejean; son Larry Maitrejean; and stepsons Ron Maitrejean and Terry Syverson. In Joanne’s honor, please consider donating to Holy Disciples Food Bank or Building Fund. To send flowers or a remembrance gift to the family of R. Joanne Maitrejean, please visit our Tribute Store. "Email Address" would like to share the life celebration of R. Joanne Maitrejean. Click on the "link" to go to share a favorite memory or leave a condolence message for the family.